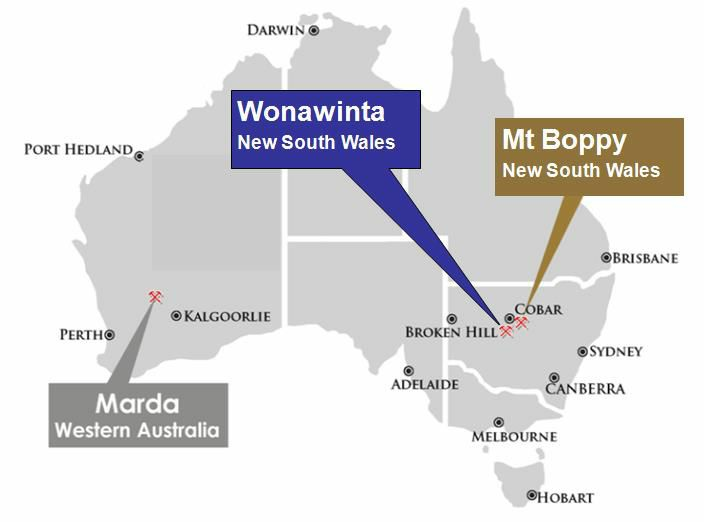 Perth, Sep 5, 2014 AEST (ABN Newswire) - Southern Cross Goldfields Ltd ( ASX:SXG) is to acquire the Wonawinta Silver Project in central NSW from the liquidators of Cobar Consolidated Resources Limited (CCR). The acquisition includes the Wonawinta process plant and infrastructure built at a cost of more than $60 million with a production capacity in excess of 2 million ounces per year, a 60 million ounce silver JORC Resource, and around 840 square kilometres of exploration ground in the highly prospective Cobar Basin. SXG will pay $375,000 in cash for the project, with completion of the acquisition planned for 19 September. SXG will also assume rehabilitation liabilities by replacing $5.8 million in environmental rehabilitation bonds with the NSW government. SXG plans to invest in a $2 million plant upgrade to deliver profitable production of silver by December 2014. This involves installing a larger 1500kW ball mill from Kalgoorlie to resolve grinding and recovery issues that hampered production by CCR. Immediate improvements in effective capacity and reduced operating costs are expected. SXG is initially focused on easily winnable, low cost ounces now available for processing, including some 350,000 tonnes of stockpiled ore, to be followed by resumption of mining from two existing pits. The project has a 60 million ounce silver Mineral Resource and a 9 million ounce silver Ore Reserve. SXG intends to use the Wonawinta plant to process ore from its Mt Boppy Gold Mine approximately 100 kilometres to the north-east. 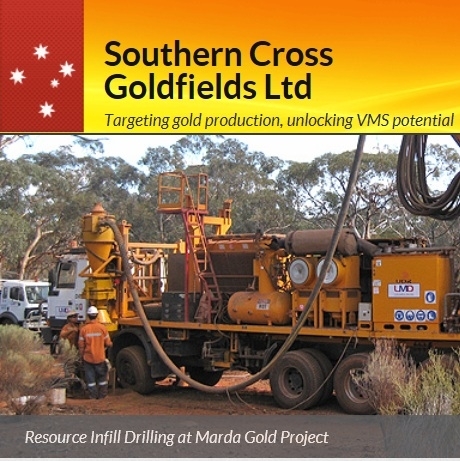 SXG previously had planned to redevelop the mine and upgrade the Mt Boppy plant to start gold production in 2015. It is now planned to truck the ore 150 kilometres by road (see Figure 1 in link below) to the Wonawinta plant for processing, eliminating the need to upgrade the Mt Boppy plant and reducing up-front capital expenditure by around $9 million. 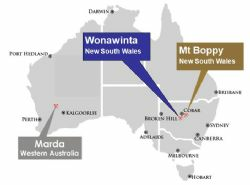 Additionally, processing through the modern Wonawinta plant is expected to lead to improved process efficiencies and higher gold recovery rates for Mt Boppy ore.
Based on current Reserves, the Mt Boppy ore is forecast to produce approximately 67,000 ounces of gold over a two-year period from mid-2015. Haulage costs to Wonawinta will be offset by lower capital requirements, higher production efficiency and better recovery. On this basis, the project's average all-in production cost is expected to be comparable to that for the existing stand-alone Mt Boppy production cost of approximately $1000 per ounce. CEO Frank Terranova said the Wonawinta transaction offered outstanding financial and operational benefits drawing on SXG's experience as a silver mine developer and producer. "Acquisition of Wonawinta adds a substantial silver project to our gold portfolio and enables us to start generating cash very quickly. It also provides an innovative and creative path for processing Mt Boppy ore at minimal capital cost and with reduced development risk," he said. "It results in a substantially lower up-front capex requirement, a significantly enhanced production profile and a major uplift in the Company's net present value. And there is potential upside from exploiting the full existing Wonawinta Reserve, upgrading some of the 60 million ounce Resource to Reserve, as well as from exploration success. "This gives Southern Cross a much stronger platform for further growth," he said. "And it builds on the extensive success we previously had with silver projects at Canbelego in central NSW and at Nimbus in Western Australia." Chairman, Jon Parker, said that the Wonawinta acquisition together with the recently announced TrailStone funding transaction would see SXG advance rapidly to the ranks of producer with an impressive and fully funded project pipeline. "The Company is now very well positioned to enter an important new technical phase in its development, with a strong financial base and the funding available to move forward and generate strong returns for shareholders," he said. In consideration of the reduced capital requirements flowing from the Wonawinta transaction, SXG has renegotiated the recently announced funding arrangements with the TrailStone Group. TrailStone will continue to provide a total $60 million debt package including an initial $25 million gold loan and a $35 million credit facility to be drawn down in stages from the first half of 2015. The previous requirement for SXG to raise a minimum of $5 million in new equity has been reduced and is no longer a pre-condition to funding availability. 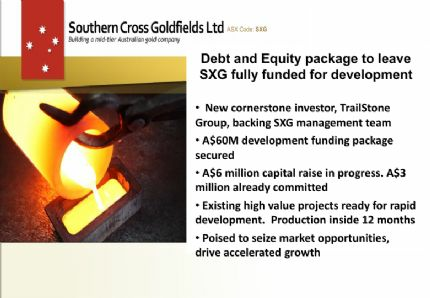 Instead, SXG has undertaken to finalise a $2 million raising in new equity within 30 days of the close of the transaction, including amounts being raised through the current share placement and small shareholder entitlement offer, which is due to close on September 10. As previously announced, SXG has already secured commitments of new equity from directors, senior management and other professional investors and is in the process of finalising these commitments. In addition, at the date of this announcement, the current Shareholder Offer has raised in excess of $600,000. Subject to completion of certain administrative pre-conditions, funding will be available for drawdown to complete the Wonawinta acquisition on 19 September 2014. TrailStone will subscribe for additional equity of $1 million once the $2 million threshold has been reached. Both issues will be at a price of one cent per share. Furthermore, TrailStone has agreed to reduce the maximum number of warrants it is to receive as part of its consideration from 1.25 billion to 1 billion with the strike price for conversion of the warrants to shares being reduced from 1.4 cents per share to 1.3 cents. If all warrants were to be converted to shares, at a total conversion cost of $13 million, TrailStone would hold up to 46% of the Company on a fully diluted basis. The reduction in the TrailStone warrant exercise price has enabled similar terms to be flowed on to its current share placement and shareholder entitlement offer with the exercise price of the options being issued reducing from 1.4 cents to 1.3 cents, matching the terms of the TrailStone warrants. Shareholders are entitled to subscribe for up to $15,000 worth of shares at a price of one cent per share, with one free option for each two shares taken up. SXG has reduced the minimum subscription amount to $1,000 and has extended the offer to September 10. 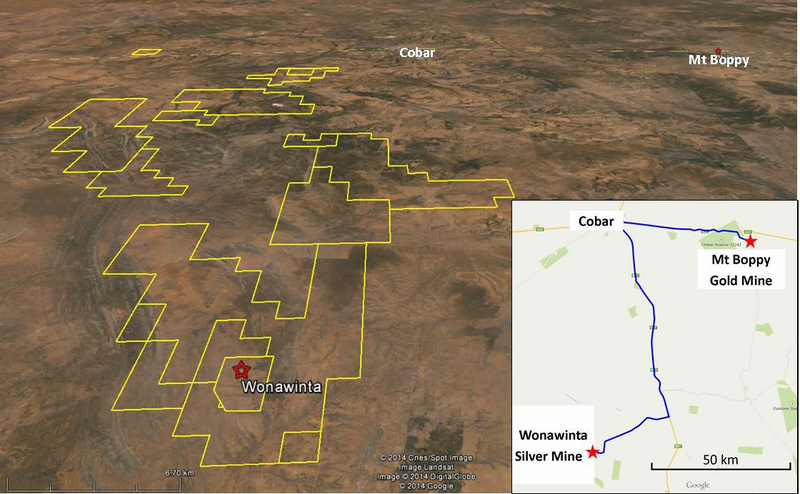 The Wonawinta Project was developed by Cobar Consolidated Resources, commencing in 2007. A maiden silver resource was declared for the project in July 2008, leading to a feasibility study, completed in June 2010. Plant construction commenced in May 2011, with first ore mined in April 2012. Mining is from shallow open pits, and processing has been via conventional CIP methods (but without primary grinding). First silver was poured in July 2012. The project produced a total of 2.1 million ounces of silver until it was placed in voluntary administration in March 2014, following production issues and high unit costs. A total of some 350,000 tonnes of ore is currently stockpiled on or close to the ROM pad, with a grade of approximately 50 g/t. The two pits that were in production when mining was halted earlier this year (Manuka and Boundary) are available for rapid recommencement of mining of ore with a grade of approximately 100 g/t. SXG's initial plan is to process approximately one million tonnes of Wonawinta ore including existing stockpiles and ore from the Manuka and Boundary pits. Based on achieving the average recovery rate of approximately 80% experienced by CCR at Wonawinta to date, this would produce in excess of 2.3 million ounces of silver. With the planned investment in operational improvements, SXG expects to meet or improve on this output, and will target the long-term cost of $16 per ounce published by CCR. 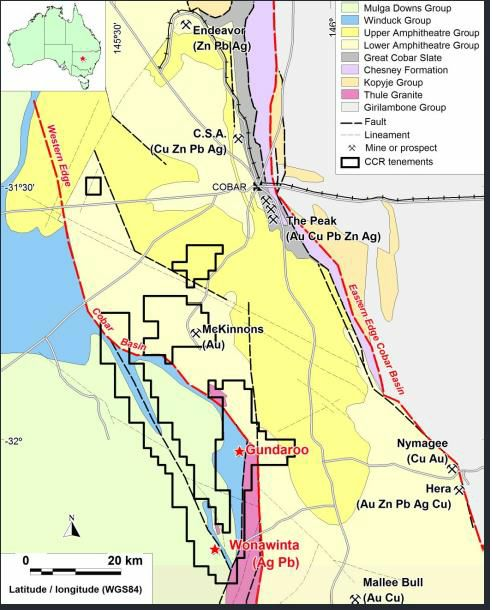 Wonawinta currently has a Resource of some 60 million ounces of silver and a Reserve of 9 million ounces, which have the potential to be brought into the production schedule in future, depending on silver prices and cost outcomes. The most recent published Resource and Reserve statement for the project, from February 2014, is shown in Table 1 below. 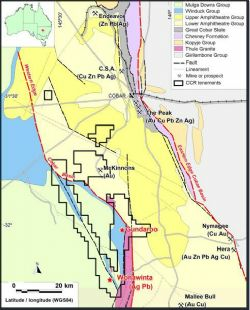 The Wonawinta acquisition also includes approximately 840 square kilometres of highly prospective exploration territory held in seven exploration licence areas. The tenements are adjacent to, and overly, bounding structures on the western margin of the Cobar Basin. These structures are interpreted as potential pathways for mineralising fluids that have formed the Wonawinta deposit and other deposits nearby. Subsequent to acquisition of the Wonawinta Project and transfer of the tenements to SXG, the Company plans to review all available data to assess the prospectivity of the tenements. The review aims to develop both short and long term exploration strategies to follow up on exploration undertaken by previous owners and to identify new targets or concepts not yet tested. CCR has reported that the tenement package is highly prospective for additional Wonawinta style mineralisation, base metals mineralisation (Gundaroo) and possibly gold mineralisation (McKinnons). Black Oak Minerals Limited (ASX:BOK) is an Australian mining and exploration company that is on the move. Investors in BOK are exposed to a compelling combination of near-term cash flow and outstanding exploration potential in the gold sector.